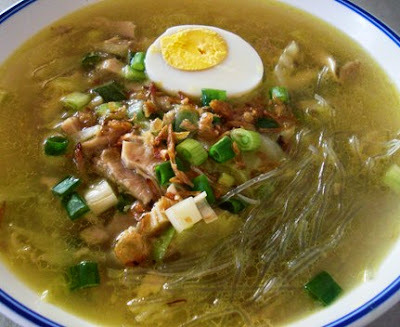 Recipe Chicken Soto - be our choice this time to review so that readers who want to know can learn to make their own. Taste the sauce is very tasteful and I often eat at mealtimes ready plus milking lime wah deh anyway. Display of clear chicken soup from various regions are diverse because that Indonesia is rich with a variety of culinary typical of each region but still give a good flavor. This time we will share the complete recipe surrounding the manufacture of cooking really fit the moment, especially if you are currently looking to and fro on the information. Such as the name suggests the use of chicken, but sometimes there is also the added such as meat, liver or gizzard satay skewer as a complement. Saute the ingredients that have been smoothed using low heat until aromatic. Boil the chicken in a pot, add seasoning soup that had been sauteed, lime leaves, galangal, lemon grass leaf leaves and bay leaves approximately 30 minutes until the chicken is tender. Remove and set aside. Clear broth that has been finished, taste and add salt or pepper or seasoning if not quite fit. Separate the chicken bone, put it back if you like chicken bones into the sauce so that more delicious soup broth. The way of presentation is enter the rice to taste, then give slices of glass noodles, bean sprouts, cabbage, tomatoes, eggs and chicken over rice earlier. Then flush with boiling soup broth and sprinkle with fried onions.